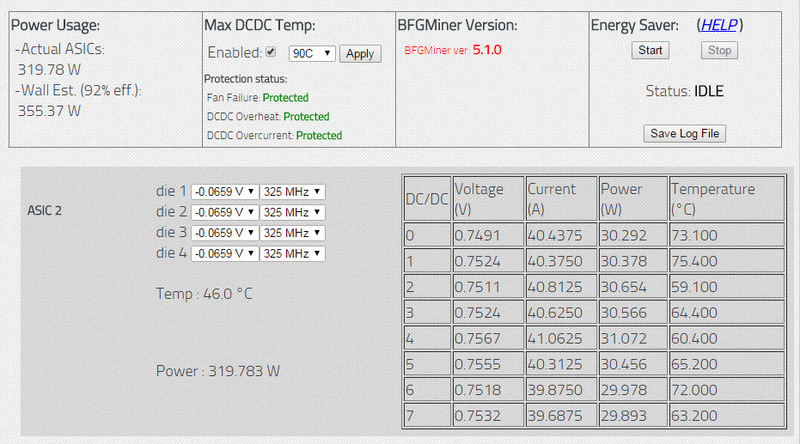 After our not so successful experiments in trying to use immersion cooling with mineral oil for the KnCMiner Titan Scrypt ASIC we have moved to trying out different things to make the device run cooler and silent. The obvious next step would be to use water cooling and the options for this are many, so we have decided to start by trying with a pre-filled closed loop All-In-One solution that is ready to be installed just to test out things. We were pleasantly surprised that KNC has decided to use standard mounting holes for 115x Intel sockets on the PCB of the device, so the installation for a water cooling solution designed to support these sockets should not be a problem. The water cooler should be capable of dissipating about 300 Watts of power coming from the Titan ASIC chip (actually four chips in a single package). We have opted out to start with a Silverstone Tundra TD02-SLIM AIO water cooler – dual 120mm slim radiator with two silent slim fans and the results we got with it cooling the ASIC were very good. Using a larger radiator and slightly more powerful fans can help you get even better results temperature wise and still have silent operation, even thicker single 120/140mm radiators could be able to handle things well enough. 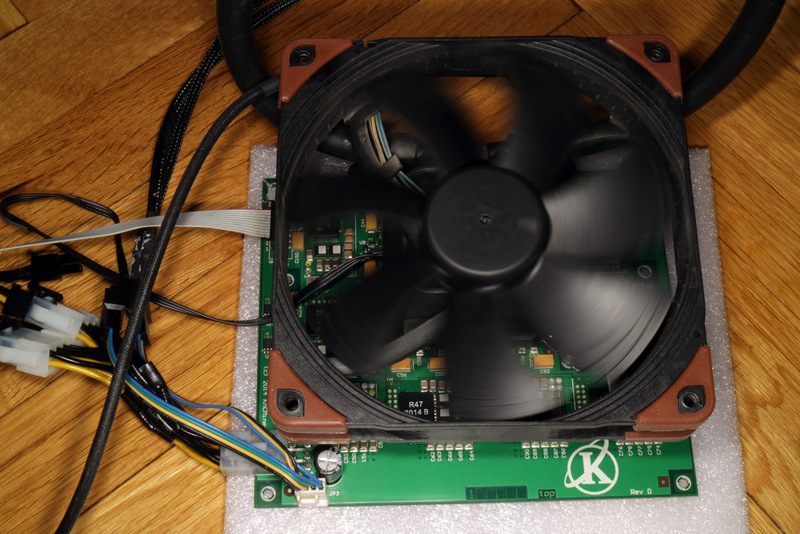 Our test with a 140mm Noctua NF-A14 iPPC-3000 PWM fan for cooling the DCDC power modules proved a success in keeping acceptable temperatures, but not in keeping the device silent. The idea to use water cooling instead of the standard water cooling is to make it run cooler and more silent. 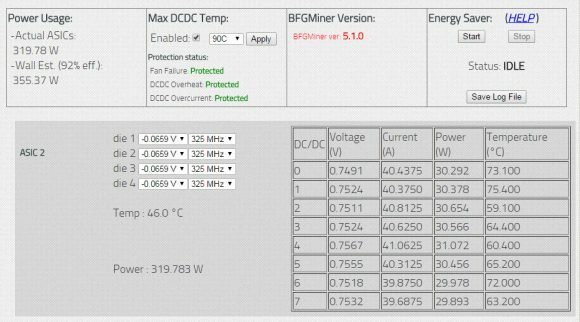 So the solution would be to do a custom set of heatsinks to fit on the DCDC power modules and have a silent fan blowing on top of them in order to make the cooling efficient and silent enough. Reusing the stock air cooling plate wit the thick thermal pads that the miner comes with will not do well, but it can give you some ideas, just make sure you use thin thermal pads or a thin layer of thermal grease. 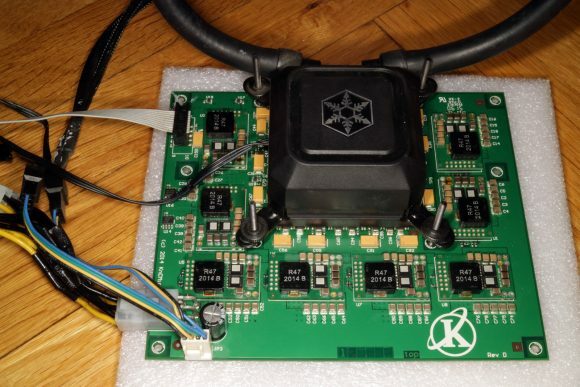 The end result will be totally worth it in making the KNC Titan run silent and effective especially for home miners with the summer heat not too far away.